Just to bore you, a little history regarding my pipe past and present. While on a business trip to Lexington, KY, I stopped at the Tinder Box and was immediately enthralled by the pipe collection displayed. I had originally gone in to get a couple of cigars. There I purchased my first pipe; a Comoy’s which I have to this day. After that I became acquainted with Mr. Ed from Ed’s Pipe shop in Nashville. He introduced me to Dunhill pipes, new and estate. I was hooked as a collector and pipe smoker. Along the way Edsel James was also instrumental in my passion for pipes. 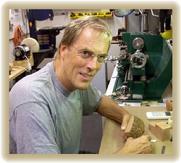 My excursion into pipe making came when I attended the course in Chicago, taught by Lee von Erck. Immediately I was hooked and wanted to tap, hopefully, the creative persona within. Following the course I studied with Tim West and then followed up with an extended visit with Lee von Erck. There is something new with every piece of briar and I will constantly endeavor to create something new with clean aesthetics and offer the collector, quite simply, a pleasurable and relaxing smoke. I would be remiss not mentioning the help received from Todd Johnson. Simply put, he is a great teacher and more than willing to share in the process. © Copyright 2006, Bruce A. Weaver. All rights reserved.